Another tiny label gem complete with low production values and a small band accompaniment Tell Me How To Find True Love nevertheless hits all the right buttons for me. 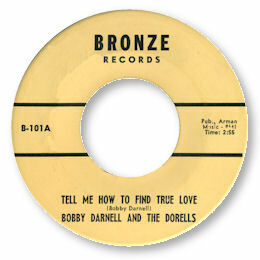 Bobby Darnell’s gloom ridden voice, heavily echoed especially in the spoken bridge, fits the mood of the song splendidly and the girl chorus from the Dorells provides emphatic support. One to listen to at 3.00 am.